Key Research Organization(s): Aarhus Geophysics Aps, Bemex Consulting International, Geoscience BC, Petrel Robertson Consulting Ltd, Scott Hogg and Associates, Simon Fraser University, SkyTEM Canada Inc. The Geoscience BC's Peace Project acquired, interpreted, and shared new baseline scientific information about groundwater resources in the Peace region of northeastern British Columbia. This project provides critical baseline information about the Peace region’s geology for future groundwater research. Groundwater has been poorly understood in the Peace region of northeastern BC and was identified as an area with significant knowledge gaps by the influential Council of Canadian Academies’ 2014 report Environmental Impacts of Shale Gas Extraction in Canada. Northeastern BC is an area of significant unconventional natural gas development. ‘Unconventional’ gas extraction is the combination of vertical and horizontal drilling, together with hydraulic fracturing (fracking), required to access the natural gas, including shale gas, tight gas, coal bed methane, and methane hydrates from within the tight rock. The Peace Project set out to locate and map shallow aquifers, specifically those within paleovalleys – the thick buried river (or glacial) deposits that usually contain coarse-grained sediments, such as gravels or coarse-grained sand. These rock units (aquifers) are excellent reservoirs for groundwater to flow through. Fine-grained sediments, such as muds and silts, tend to make poor aquifers. Geoscience BC and partners completed the Peace Project between 2015 and 2018. The increased understanding of aquifers and shallow groundwater in the Peace region makes it possible for First Nations, energy companies, communities and government to make informed decisions about the use and protection of water resources. Freely provided baseline information to First Nations, communities, government and industry to help make informed groundwater management decisions. The Peace Project was the first large-scale effort to map northeastern BC’s groundwater, using helicopters carrying geophysical equipment. The geophysical data and knowledge generated by the project has greatly increased the current understanding of shallow aquifers in the region. Regulators may use this independent baseline information to create policies to protect groundwater resources in the region. 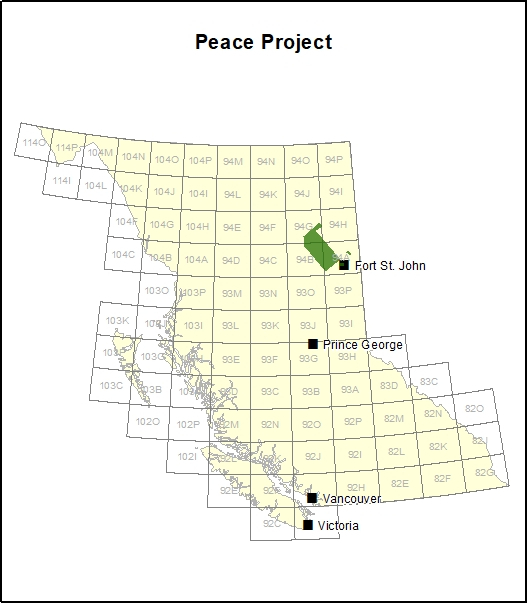 The Peace Project was supported by several partners, including Progress Energy Canada Ltd., ConocoPhillips Canada, BC Ministry of Forests, Lands and Natural Resource Operations and Rural Development, Northern Development Initiative Trust, BC Oil & Gas Research and Innovation Society, the Ministry of Environment & Climate Change Strategy, the BC Oil & Gas Commission, and the Ministry of Energy, Mines & Petroleum Resources. It had additional support from the Peace River Regional District and the Canadian Association of Petroleum Producers. Natural gas development involves drilling vertical wells to a depth of approximately 3 km, then drilling a horizontal leg of 1-3 km in length away from the vertical well bore. The horizontal leg is then hydraulically fractured to access the gas within the tight rock. As these techniques have advanced in the last 15 years, it has become possible to economically develop this extensive, unconventional siltstone resource. Energy companies, such as Progress Energy, Conoco-Phillips and Painted Pony, have been active in the Montney in recent years. Given ongoing natural gas development, First Nations and local communities are interested in finding out more about the groundwater resources beneath their feet and ensuring that the resource is used responsibly. The first step in understanding groundwater in the region was to build a thorough understanding of sediment types and where they occur. An initial airborne electromagnetic (EM) geophysical survey was used for the Peace Project because it is a non-invasive, cost-efficient way to study geology below the surface. It was the first regional-scale survey to map sediment types in the Peace. For the survey, a helicopter flew 9,600 km2 (roughly 21,000 line km at 600 m spacing) of the Peace region between Hudson’s Hope, Charlie Lake and Pink Mountain during July and August 2015. A 16 m by 28 m ‘hoop’ suspended below the helicopter collected information about how well the sediments and water below the earth’s surface respond to small amounts of electricity: the power source was a car battery. In addition to the EM survey, geological mapping and hydrogeological (rock and water) data from new and existing oil and gas boreholes and water wells was collected. In tandem with the new EM survey data, the mapping and borehole information was used to calibrate the findings of the geophysical survey and to produce new maps, two-dimensional (2D) cross-sections and three-dimensional (3D) block models mapping the distribution of sediments and aquifers below the surface in the Peace region. Some additional holes were also drilled to ‘groundtruth’ Peace Project findings. Finally, all of the data and interpretations generated during the Peace Project was combined in a single report, published in May 2018.
the networks of aquifers near the surface may be suitable for other uses, such as domestic water wells. This report summarizes the results of a drilling program conducted in 2017. Levson and Best studied the materials found in the holes to test the accuracy of the geological models built from geophysical data collected by helicopter in 2015 (Geoscience BC Reports 2016-09 and 2016-18). Eleven holes were drilled at eight sites chosen from the geophysical survey. Groundwater monitoring wells were installed at two of the sites. by Bemex Consulting International and Quaternary Geosciences Inc.
by Petrel Robertson Consulting Ltd.